Publishing group DC Thomson - owner of the Press and Journal and Courier newspapers - has bought two Scottish radio stations. 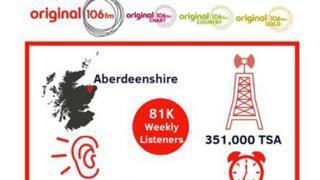 Aberdeen-based Original 106 and Kingdom FM in Fife were acquired in the deal. DC Thomson now owns three radio stations, following the purchase of Wave 102 in Dundee in 2017. It is understood the Original studios will move in to the new Aberdeen Journals offices at the Marischal Square development. DC Thomson chief executive officer Mike Watson said: "These acquisitions firmly position us as the largest Scottish-owned radio group. "We're excited to have brought these two great stations into our radio portfolio and look forward to working with the teams there to strengthen the offering to listeners, and provide them with quality local news content."